Who says the holiday only starts when you get there? Start by booking a limo to take you to the airport to ride in style. Follow that up with a stop in the airport lounge. Lounge passes can be booked for as little as £20, proving luxurious treats don’t have to cost the earth. First-class flights and transfers, also do-able. Whatever it takes to start the honeymoon the right way. It’s the little things, right? For an added personal touch, why not arrange chocolates and champagne to be placed in the room for when you reach the hotel? Telling the hotel it is your honeymoon might even get you those little perks for free. Get the sparks flying right away because, well, you deserve it. Is there a better way to cap off a fabulous day together than by enjoying dinner for two, wonderful drinks, with candles and the best possible service? What about all of that, but on a secluded beach, where you are the only two people there. Here you’ll be enjoying the sounds of the waves lapping gently in the background as the sun sets in the sky. Bliss. The definitive choice in relaxation, what girl doesn’t love being pampered? And secretly, most men will happily be looked after too, facials and all! Unwind with a visit to another paradise. 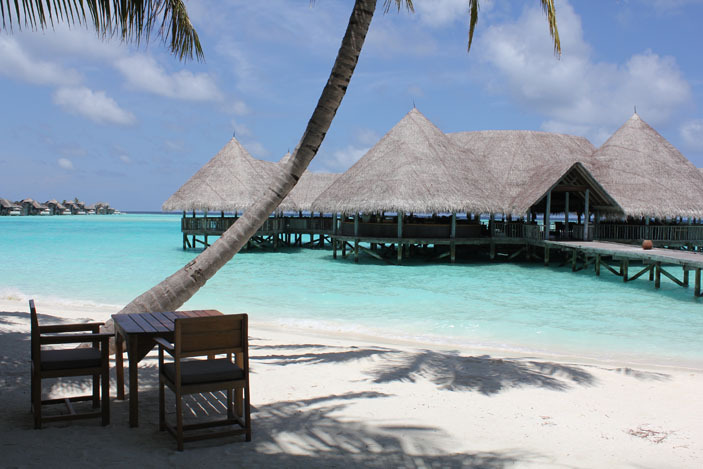 Places such as the Maldives have two massage tables in the same room. With glass floors and a glorious view to the sea. Ultimate comfort, for two. For that real sense of dual adventure, why not test your collective mettle and explore the mysteries of the ocean, and the many wonders it has to offer. Whether you prefer to be safely along the surface with a snorkel or challenging the lower reaches, there are options for everyone. And spectacular sights for all, from scuba and deep-sea diving, to swimming with dolphins. This shared experience will bring the two of you closer together through a mutual appreciation of each other, and the creatures you will share the waters with. And if you’re feeling really brave, you can one-up the dolphins and enjoy a date with the sharks! High-adrenaline experience together. Or a more languid exploratory trip. Your loved one and you will be laid bare as you challenge each other’s natures and be surprised to discover just how much you can. From an Amazonian jungle hike, to a Hawaiian volcano trek, to the high-flying excitement of a rapid zipline, the only boundaries are your own, but the world around you will truly be your oyster. Once in a lifetime experiences during a once in a lifetime honeymoon… it’s the perfect combination. Tried and tested formula for success, nothing says romance like cuddling up together and watching the day fade into night. However, to significantly up the serenity, push the boat out – literally! – and enjoy an extra personal excursion as you witness one of the most romantic sights this world has to offer, in the most exclusive manner available. Watching the sky’s metamorphosis can seem like an intimate personal display just for the two of you, one that you’ll never forget and the perfect way to set sail on your way into married life. To put these ideas into practice and uncover more of your own, why not visit our honeymoon expert, Holidaysplease, to start adding the next chapter of your whirlwind romance!